*Warning* - this post contains photos of a rat (albeit a very cute one, but I may be biased), including a rat tail, so if you are one of those people who are squeamish about rodents (and there are a great number, I have discovered), proceed at your own risk. Christmas is unfortunately all too often fraught with stress - unpleasant interactions with relatives, too much money spent on gifts, and more time spent travelling than relaxing. I did manage to avoid all of the above, and I hope that you did too. There are some very nice things about the holidays as well - time away from work (for those of us lucky enough to get it) that can be used to catch up on reading, napping, watching movies, and indulging in some very yummy meals with friends. I will confess that most of my time off has been spent bonding with Fred (see two posts ago for the introduction...) and figuring out what treats she likes. Lettuce, apples, pears and red peppers have gone over well. Bananas, not so much. We have already experienced "The Great Escape", when she channeled her inner Steve McQueen on Christmas Day, shot out of my friend's hands like a cannonball, and scooted under the couch. The 40 minutes that followed were stressful for all involved, but all's well that end's well. I'm hoping that being called a "f**cking stupid rodent" in a moment of acute frustration won't scar her for life. 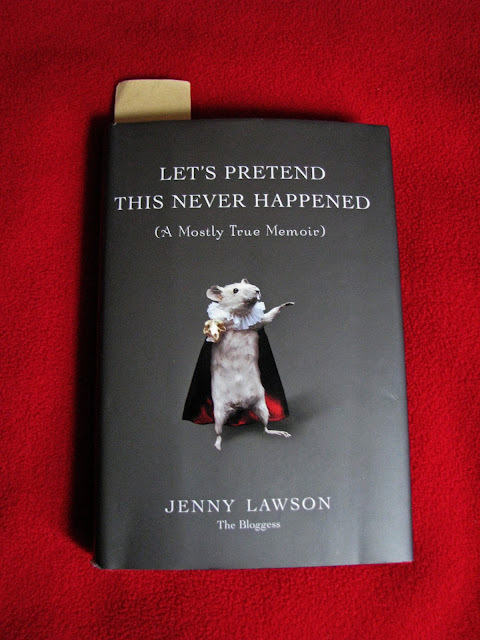 Even my holiday reading had a rodent theme...a friend loaned me her copy of Jenny Lawson's (aka The Bloggess) memoir, "Let's Pretend This Never Happened", that includes stories of how messed up it is to grow up with a father who is a taxidermist, and kind of crazy. It is a wildly entertaining read, as is her blog. In fact, her latest post makes me think we could definitely be sisters under the skin. Lawson has a collection of taxidermied mice, that includes Hamlet, pictured on the cover of her book. Of course there was some thrift shopping...I was in Toronto and discovered that my favourite Salvation Army Thrift Store had 50% off all their clothes that day, so I ended up with 3 skirts, a shirt, 4 new Chinese embroidered robes in their plastic packages, and the Japanese-style robe in the photo above, all for $28. The skirts are steamed and waiting for warmer weather, the Chinese robes were given as gifts, and the home-made Japanese robe is on my bedroom wall. I made a stop at 69 Vintage, on Bloor St. West, where I met the most adorable young aspiring fashion designer and stylist by the name of Aziz Vivant. He is ridiculously young, talented, and incredibly stylish, which you can see from his blog. We had a delightful conversation while I tried on coats (have I mentioned before that I have a severe coat problem?). 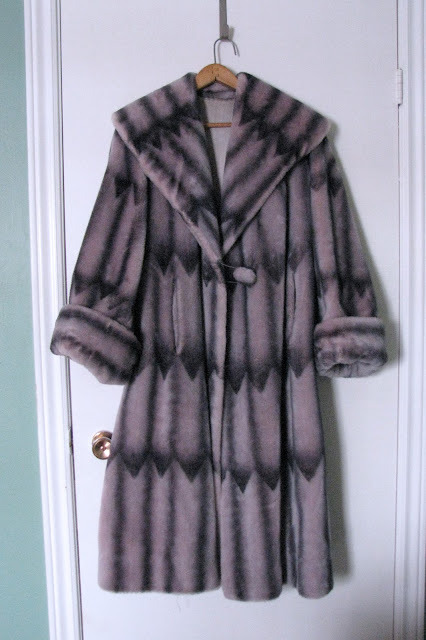 The store was having a sale, and I ended up coming home with this one, which has a label inside that proclaims it's "furrier made, designed in London, and is pure NYLON pile". I will not be wearing it near an open flame. So far, the list of movies watched over the last week includes: Mr. Hulot's Holiday (one of my favourites from french comic Jacques Tati), Magic Mike (for the story, of course..), Hitchcock (featuring Anthony Hopkins and Helen Mirren) the British film, The Trip, and the obligatory Christmas eve viewing of the classic, White Christmas. I confess that I am kind of looking forward to heading back to work this week. I need my routine, and an excuse to get dressed in something other than cozy pants and a t-shirt. Thanks so much to all of you for your support, your comments, and your inspiration. Wishing all of you a Very Happy New Year - see you in 2013! God, that's a luscious coat! 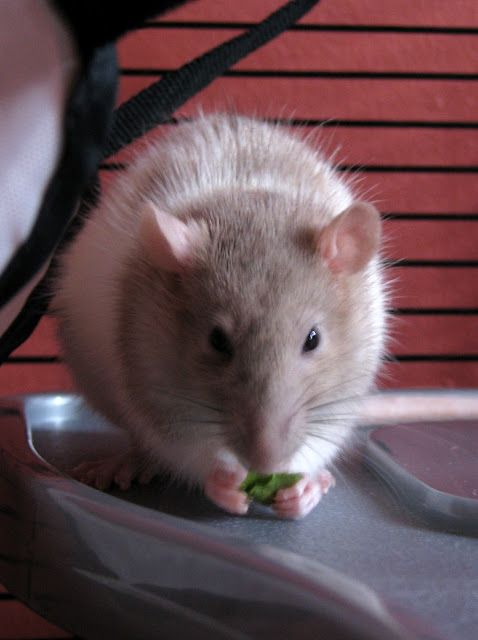 You'll be in direct competition with your little ratone when it comes to beautiful and furry! Fred is a cutie. The book by Jenny Lawson looks like a great read. I'll have to check it out. Absolutely love the coat and the Japanese robe. I have truly enjoyed reading your blog this year and look forward to following you in 2013. Have a safe New Year! That's an amazing coat, and I can imagine it looks great on you! Don't spill nail polish remover on it. We're going to see a movie tonight called "Old Goats." I would say that my husband is starring in it, but that would be unkind. with the deco-ish vibe! Have a great New Year! Awesome holiday! Fred is very dear, and smart besides. I envy your Toronto adventure, and wow, what a marvellous coat. Looking forward to meeting in-person in 2013, and wishing you and Fred much happiness in the coming year! Fabulous post and fabulous coat! And have a fabulous new year! Bizarrely, and for the first time in my life, I am also looking forward to being back at work tomorrow - what does it mean??? Fred is super gorgeous - I love her! Does she make the little 'purring' noise - the clicky teeth sound near your ear, when she's content? I love when they do that. The new coat is SPLENDID! Can't wait to see you model it for us! Happy New Year,sweetcheeks! To you and the lovely Fred! Little toad, trying to escape!!! Ah, furry critters,they're endlessly entertaining and frustrating! Wonderful scores you've made! Our thrift stores close over the holiday period,dammit.So I am pining a little....!!! That sounds like a very satisfying holiday indeed. I think Fred is adorable and of course she is clever. Such beautiful clothes you've found! I hit some sales today and came home empty-handed. I was not moved. Happy New Year!!! So so cute and sweetly furry!!!! Happy new year!!! Love the coat it's amazing!!!! Happy New Year to you, Shelley! I am so glad you had a relaxing and stress-free holiday. Fred is a cutie and I'm glad she's finding her way around her wee domain! And I LOVE your coat - it's gorgeous! You have to show us what it looks like on. I have a coat problem too, and also a bag problem, and a costume jewellery problem! I checked out the stylist who works at 69 Vintage and his work looks so very pro. Have a wonderful 2013! Happy New Year to you, Shelley and Fred ! Fred has such a sweet face! In my experience ratties don't like being held much but usually will sit on your shoulder nicely - for awhile at least. Extra points for hair or a hoodie they can hide under! You can also play "bridges" where they walk across your arm to another shoulder. Happy New Year to you and Fred! It looks and sounds like you had a wonderful holiday, what with Fred, the gorgeous thrift finds, great reading and meeting a new designer. I share your love of coats and this one is a beauty. Happy New Year Shelley! You are one of the gifts of the blog world! I love Fred. Will start making some kiddie lit rat referrals. "Mrs. Frisby and the Rats of Nimh" is a good place to start. Happy 2013, Gorgeous! Here's a rat-snack tip I learned when trapping an escaped pet white rat in a neighbor's back yard (before a hawk or cat other rats could catch her first): RATS LOVE AVOCADO! (Who knew?) 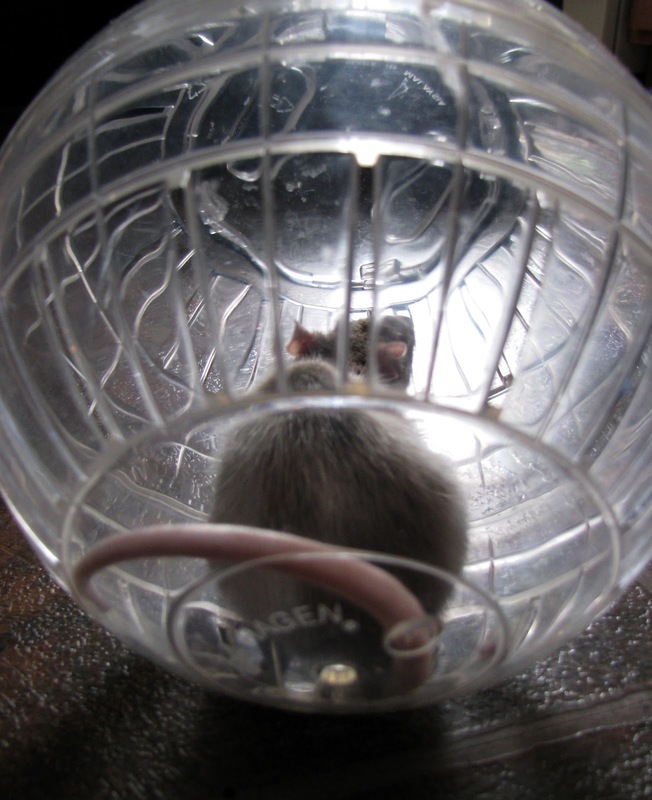 A rat expert contacted via Craig's List told me peanut butter bait just wouldn't cut it & told me to use avocado. After 4 unsuccessful nights using Skippy peanut butter, as soon as I got the tip, I changed the bait and could barely get my hand out of the Have-a-Heart trap before the little sweetie ran in and munched happily as the trap's gate slammed shut. 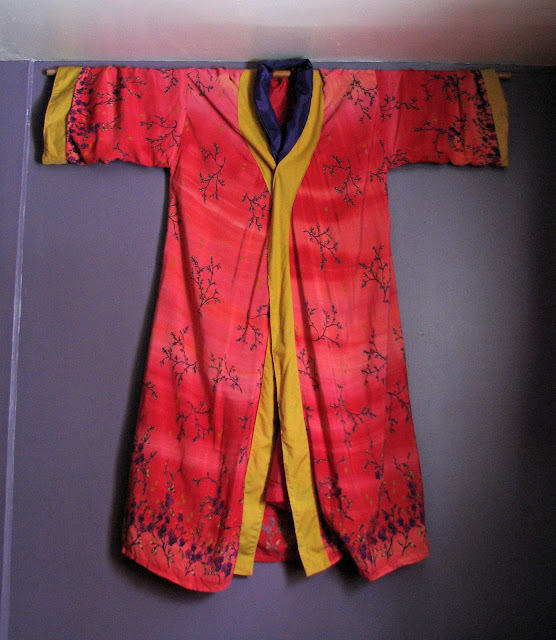 LOVE the Japanese robe. That rat is so cute my daughter had one when she was a teen when she left to live with her father i inherited the rat! Isn't fun when you stumble on a 50% off sale! Of course you came back with a few items;) i would too maybe more than you! Well i will be off for a while i guess and loving it!